The first residents of the islands are said to be the Phrygians, the Leleges, the Karres and the Phoenicians who settled down in coastal areas or moved inland in order to protect themselves from raids. 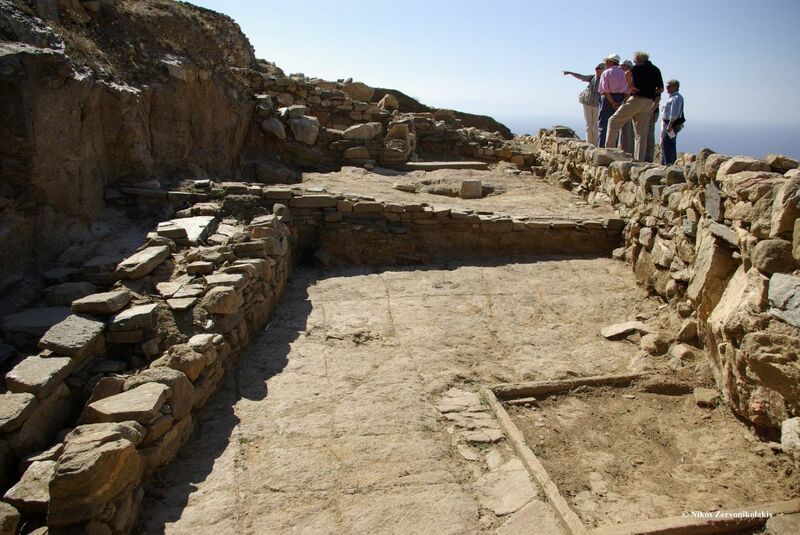 The Neolithic Era (5000-3000 BC) and the early Bronze Age, also known as Protocycladic Era (3000-2300 BC) remain without having given any major archaeological finding in Tinos, in contrast to the other islands of Cyclades. Few findings in the southern cape of the island, on Vrekastro hill signify that it was possibly inhabited during the early Bronze Age or mid-Cycladic ear (2300 – 1600 BC) when the settlement is fortified better with a fortress wall, parts of which are recognizable beneath more recent stone walls. 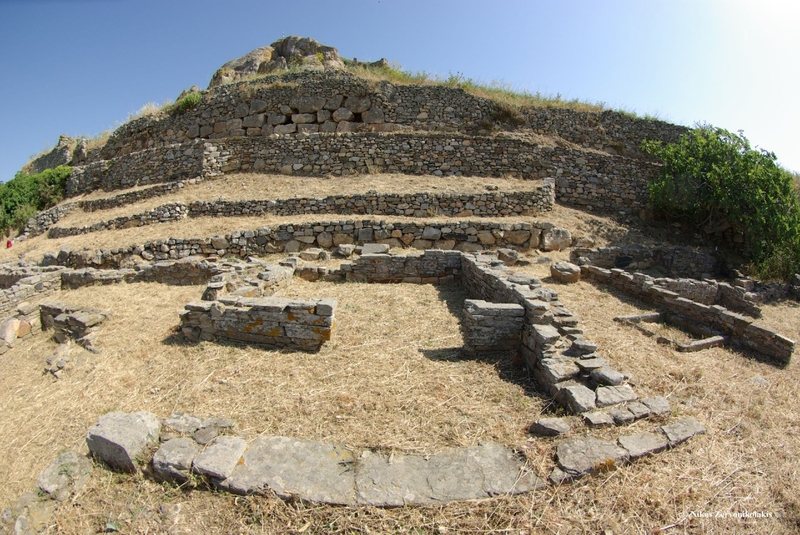 The Post-Hellenic Period I and II, the first Mycenaean Era (1600/1550-1400 BC) remains, until now, also without any findings in Tinos. The Mycenaean period is represented by a small domed semi-demolished tomb which was discovered in 1979 in an area north of Pyrgos, close to St. Thekla and the monastery of Lady Kseni. During the Dark Ages (1100-900 BC) when piracy is at its peak, movement of settlements from coastal areas towards the mainland is noted in the Aegean islands, in areas with natural barricades with a clear line of sight of the sea. 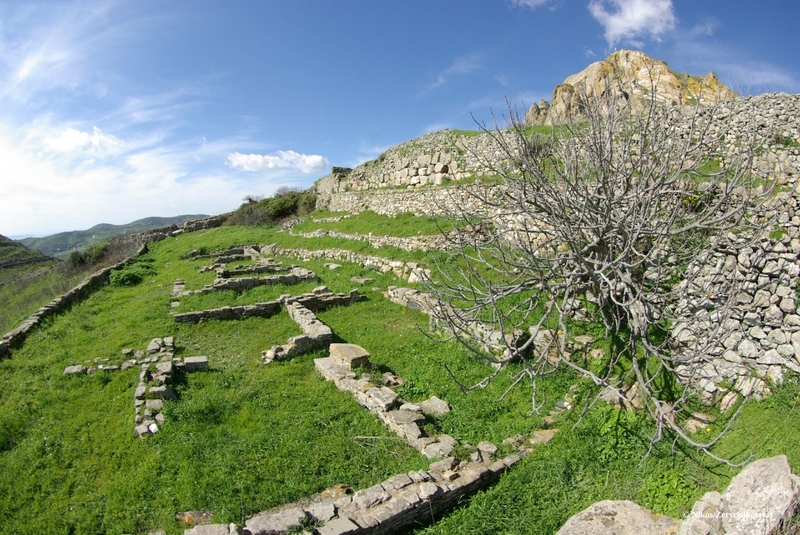 In Tinos such a fortified settlement is developed in the south west roots of Exombourgou, where we recognize the findings of a huge wall and in Kardiani in a close and safe position, close to the church of St. Nicholas where the ruins of lodgings and a graveyard have been recognized. 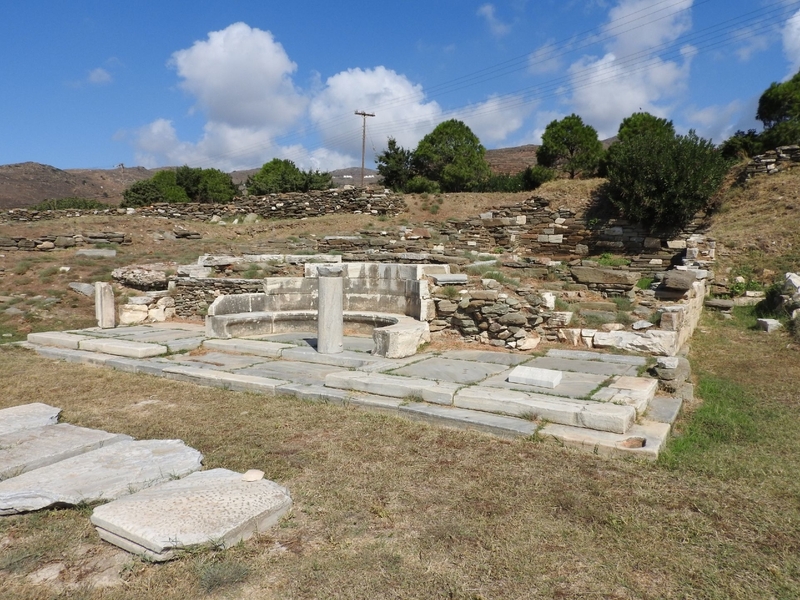 The end of the Dark Ages seems to find Tinos at the peak of its development in Evoia. 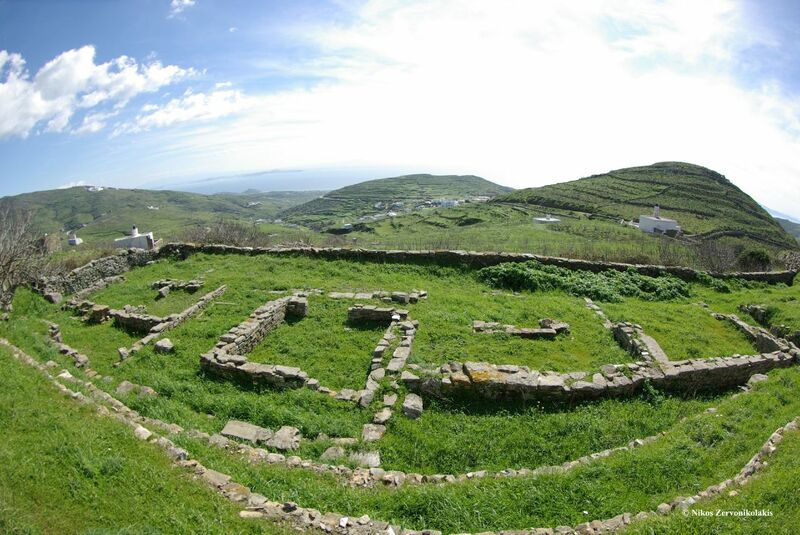 During the Geometric Period (9th and 8th centuries BC) the influence of Evoia adequately competes with that of Attica in Tinos with a view to dominating it and controlling the Shrine of Dilos. 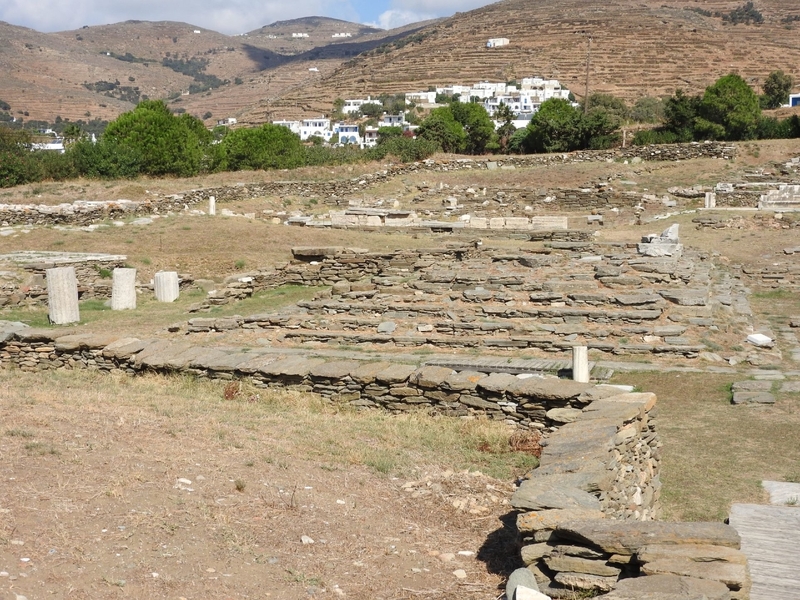 During the 8th century BC in south Tinos the administrative centre is organized in Exombourgou where the findings offer characteristic evidence of a very well organized settlement with cohesive social structure. This settlement, during the 7th century BC is now the big centre which functions as the capital of the island. 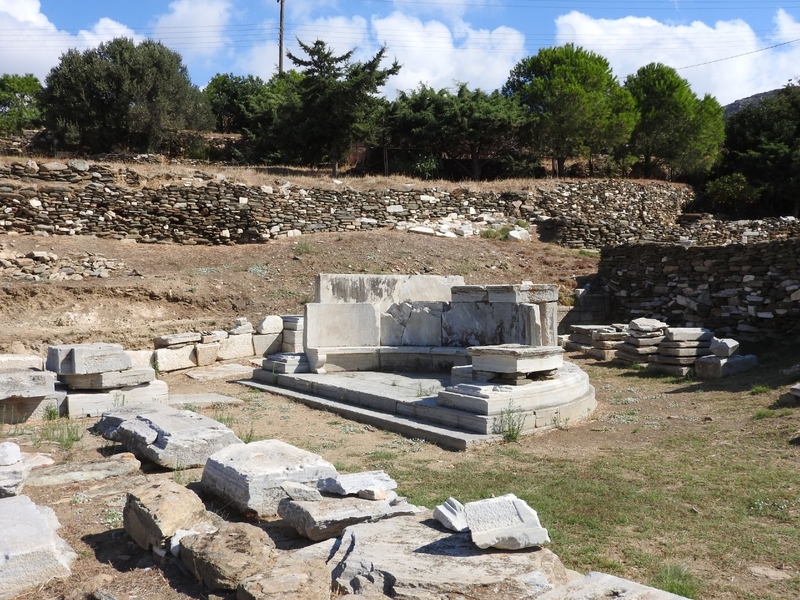 In 664 BC after the dispersion of the confederation of the Eretrians from the Cyclades the Athenians are now in control of the Shrine of Apollo in Dilos thus increasing their influence on Tinos. 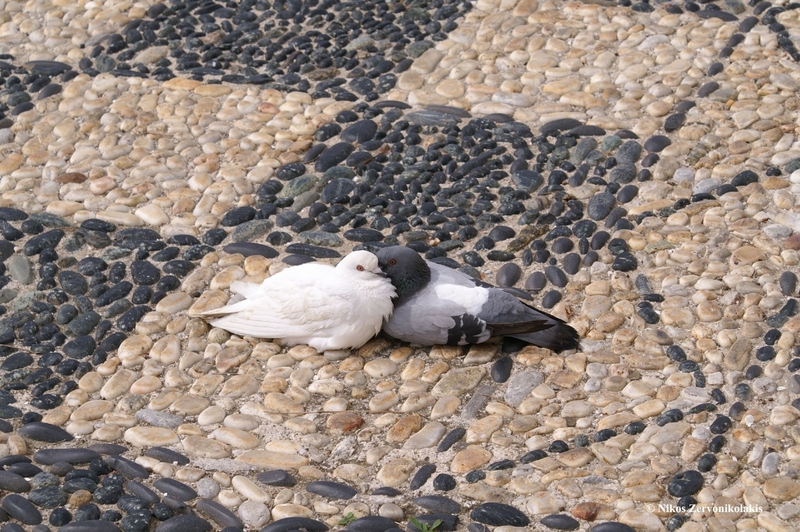 In the later Archaic Times (6th century BC) close relationships with the Athenians are developed. 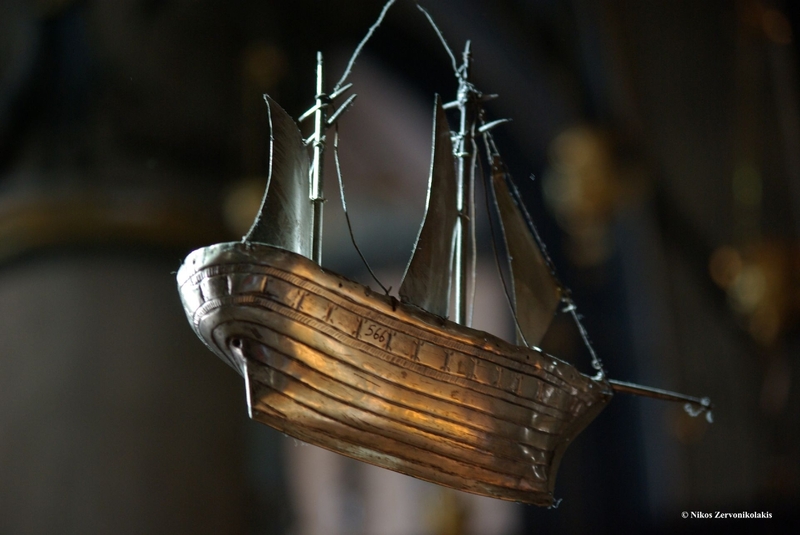 Consequently, there was an increase of activities related to the sea and the development of settlements around Poles Hill (area of the temple of the Virgin Mary). 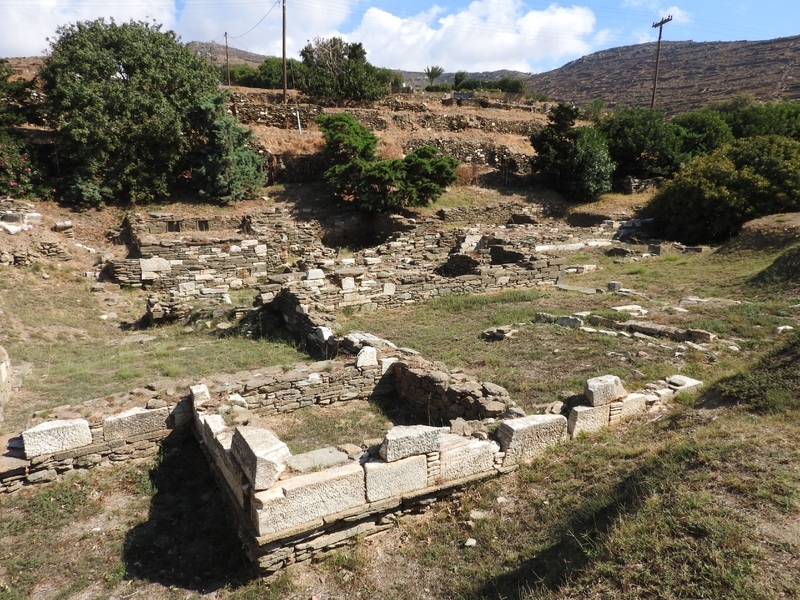 The later union of these settlements led to the creation of Asti (City) for Tinos is reinforced by the construction of a water supply reservoir by Peisistratos (549-542 BC). During the Early Classic period (5th century BC), the time during the beginning of the Persian Wars in 490 BC and 480 BC, Tinos is conquered by the Persians. In 477 BC an alliance is signed with the Athenians and gives form to a new local balance. The Later Classic Period (4th Century BC) was an extremely difficult period for Tinos. 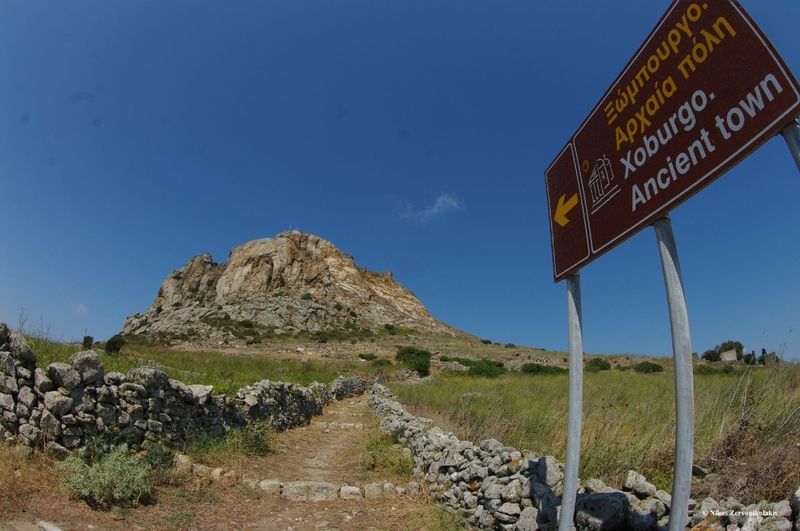 The administrative centre of the island is transferred from inland, in other words, Exombourgou, to the coastal zone around the two hills of Megalohari. The core is created around the hill Poles, the settlement develops into a large urban centre, Asti (City) is fortified with a powerful wall which remains to this day. The centre of Asti with its market, theatre and possibly with the shrine of Dionysos is organized around the Temple of the Virgin Mary. Despite difficulties during this period, the port of Tinos is used an in-between stop for ships headed for Dilos. 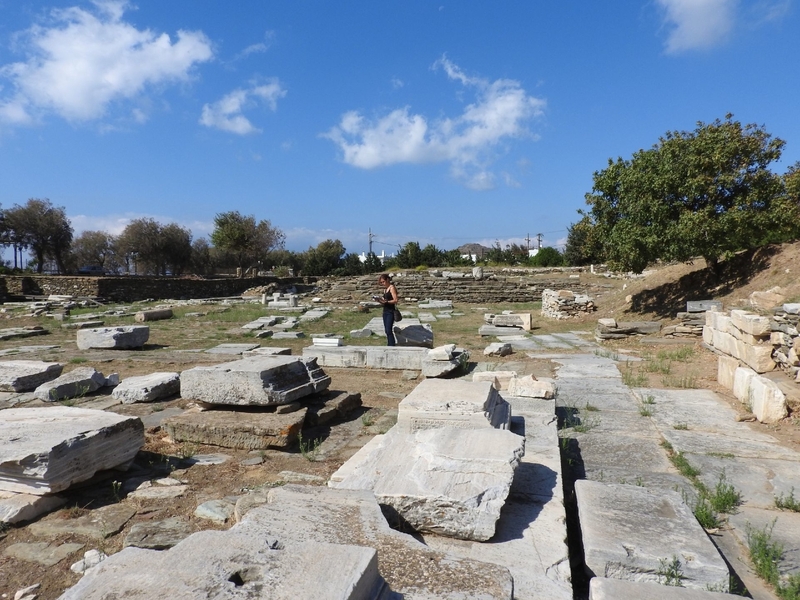 In the present area of Kionia, the huge shrine of Neptune and Amfitrity is developed, a fact which is certified by the excavations done in the area. From 338 BC after the defeat of the Athenians, the dominance of the Macedonian generals begins. During the Hellenistic Period, the dominance of the Macedonians is succeeded by the dominance of the Ptolemians until 260 BC when Tinos is once again placed under the rule of the Macedonian king Antigonos, until 244 BC when Ptolemy the 3rd of Egypt becomes master of the Cyclades. A difficult period follows from 220 BC to 200 BC. Then the Rodians with their allies, Attalos of Pergamos and the Romans, conquer many islands of the Cyclades and Tinos, giving them, however, their autonomy. Tinos, now, becomes the headquarters of a confederation whose representatives meet during the celebrations of Neptune and Dionysos. In the Roman Years and the Late Archaic Period, after the collapse of the Macedonian state in 146 BC, Tinos becomes part of the Roman Empire, as part of the province of Asia Minor. After the destruction of Korinthos, Dilos is declared the sole centre of commerce. The small but renowned island becomes an in-between stop and with its harbors provides safety to ships sailing from Greece and Italy to Asia and Africa. This blooming of commerce in Dilos is beneficial to Tinos. In 88 BC Dilos is destroyed by Minofani, general of King Mithridati VI and frequent raids by pirates damage the Aegean islands. In 67 BC the Romans pursue and liberate the Greek islands from pirates. 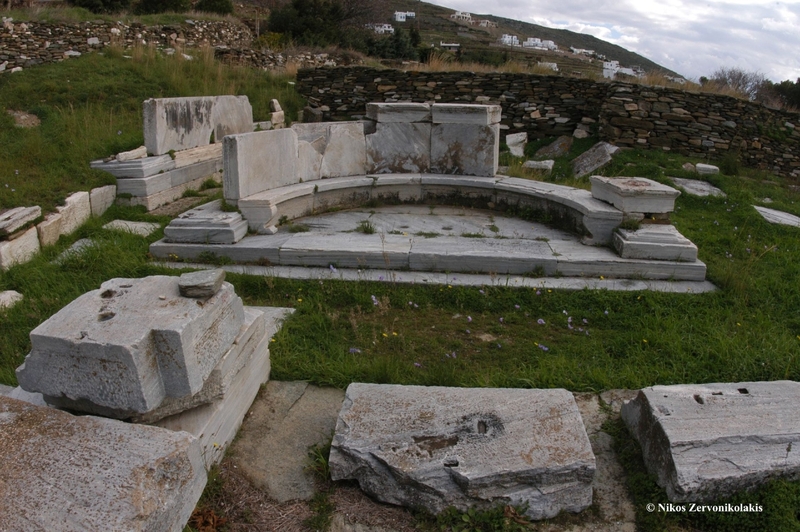 In 268 BC, after the destruction of Athens, the raid by the Eroules at the Cyclades has as a consequence the looting o various islands, one of which is Tinos, and the abandonment of the shrine of Neptune and Amfitriti. The characteristic of the Byzantine Period (337BC-1207 AD) is the cultural, demographic and economic decline of the area, raids by pirates, the transfer of settlements towards the mainland, raids by barbarian tribes, epidemics, earthquakes and the eruption of volcanoes (Santorini 557 BC and 740 BC). Exombourgo, due to its safe position becomes, once again, the suitable location for the capital of the island, the first, fortified medieval city, Castello di Santa Elena. Other settlements of this period are Karia, Tripotamos, Kambos, Loutra, Mesaria, Sklavohorio, Steni, Potamia, Diohoria, Komi, Kelia, Agapi and Pyrgos. Constantinople (Istanbul) falls to the Francs and the Venetians on 12th April 1204 and Tinos Island is under the Ghisi occupation (1207 AD-1390AD). 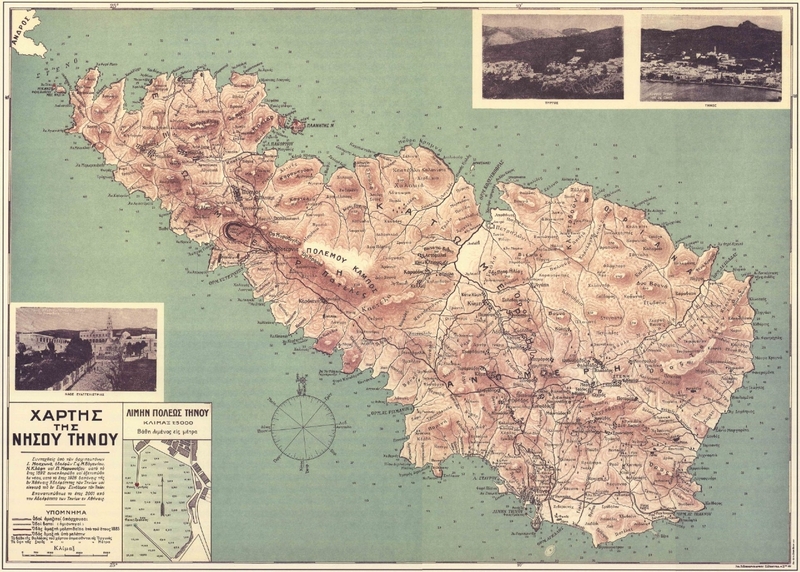 Tinos is administered among other areas, by the first Latin Emperor of Constantinople, Marchioness Valdouino of Flandra and is later ruled by the Ghisi brothers and is placed under the jurisdiction of the Latin Emperor. The Venetian, Andrea Ghisi, sets his permanent residence in Tinos. He is succeeded by his descendants, till the death of the last George Ghisi III, the Ghisi impose upon the island a Latin church, while the castle becomes the capital of their petty state. During this period, colonization from other parts of Greece is observed especially Northern Greece and Eastern Aegean islands, from Crete but also by foreigners such as Venetians of Italian descent, French and Spaniards. The relationship of Tinos and Venice is inaugurated in 1204 AD. During the Venetian Occupation (1590 AD-1715 AD), the venetian rule is established in 1437 AD and remains so until the beginning of the 18th Century, when it constituted itself as a hostile wedge in the body of the Ottoman Empire (Venetian-Turkish war 16th and 17th Centuries). During this period, the residents of Tinos viciously defended themselves along with the Venetians, and the island was organized as an attack point of the venetians in the Aegean, against the Turkish fleet. The castle at Exombourgo and this period of Turkish raids operates as a concentration point of the residents. The castle is handed over to the Turkish Admiral Tzanoum Pasa in 1715, after a fierce siege and the surrender of the Venetian Commander Bernardo Bali. The transition to this new regime takes place peacefully and enclosed within the castle rural population moves back peacefully to their villages. The old capital, however, at the castle of Exombourgo, is gradually abandoned and the castle is destroyed. The residents are moved to the island’s present capital, the port of St. Nikolas, while gradually the settlements of Exomeria come alive, as well as these in Mesa and Epano Meri. The official surrender of Tinos to the Ottoman Empire takes place in 1718, with the Passarovich treaty. The transition from Venetian to Turkish rule takes place smoothly and slowly, during the Turkish Occupation (1715 AD-1821 AD). Tinians are not punished for their hostile stand against the Turks, on the contrary they are given privileges and their self-administration is ensured. 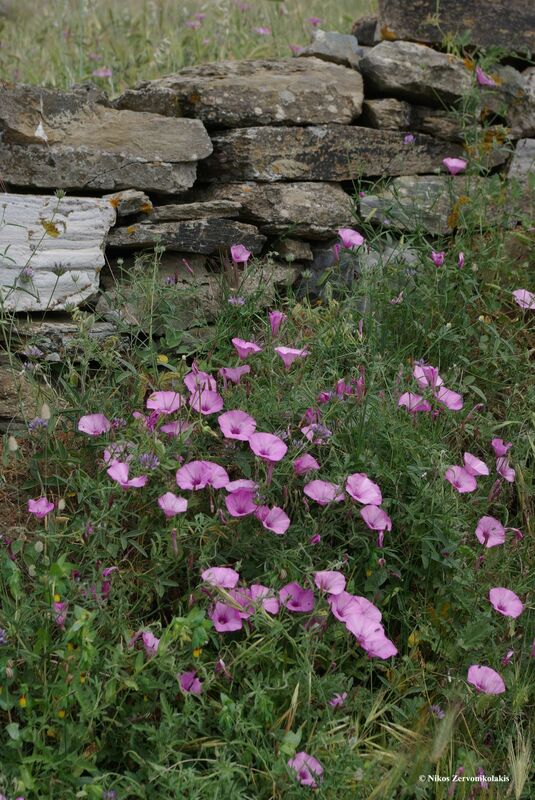 The Greek flay on the island of Tinos remains n its place. 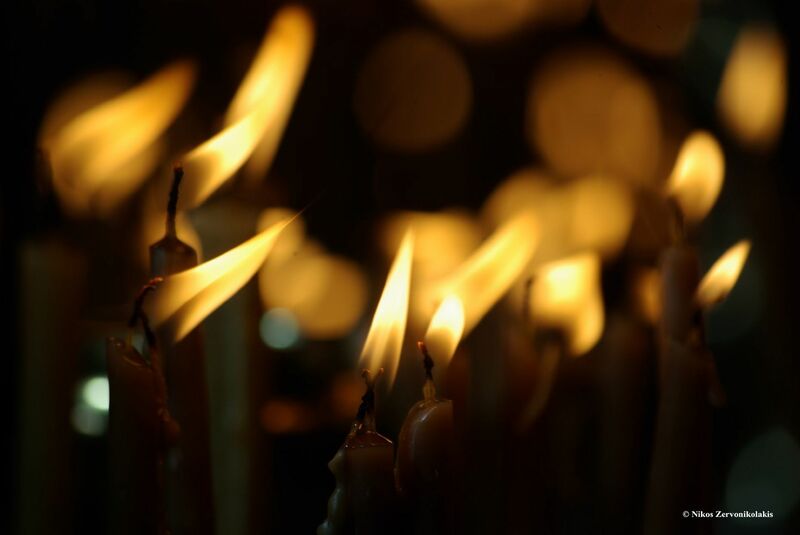 The orthodox community obtains the freedom of its religious conscious and in time, the dogmatic differences between Orthodox and Catholics are resolved, ensuring compassionate and peaceful co-existence. The period 1771-1774, Tinos is handed over to Russia occupation. An important role, during this period is played by the presence of representatives of European Forces and their relationship with Tinian citizens, as well as the mobilization of population. Tinos during the years of the revolution: The flag of revolution is raised first by the settlements of the Cyclades islands, Pyrgos in Panormos. The residents of the Mesa and Epano Meri gather also and join them, in an army aimed at ridding itself of Turkish rule. 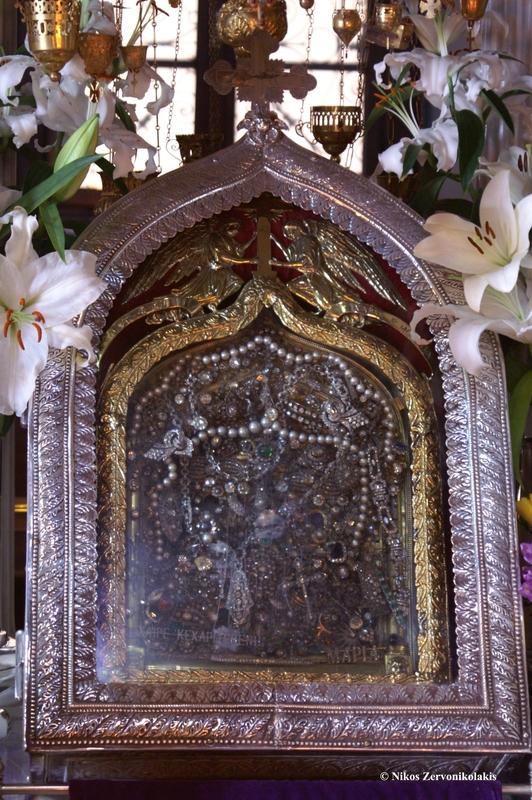 On 30 January 1823, the venerable picture of Virgin Mary (Megalohari) is revealed in Tinos and the air is full of divine aromas. The church assumes the character of “Charitable Institution” with vast goals. Tinos today: The creation of the Neohellenic state gives end to the insecurity and riots of revolutionary years. 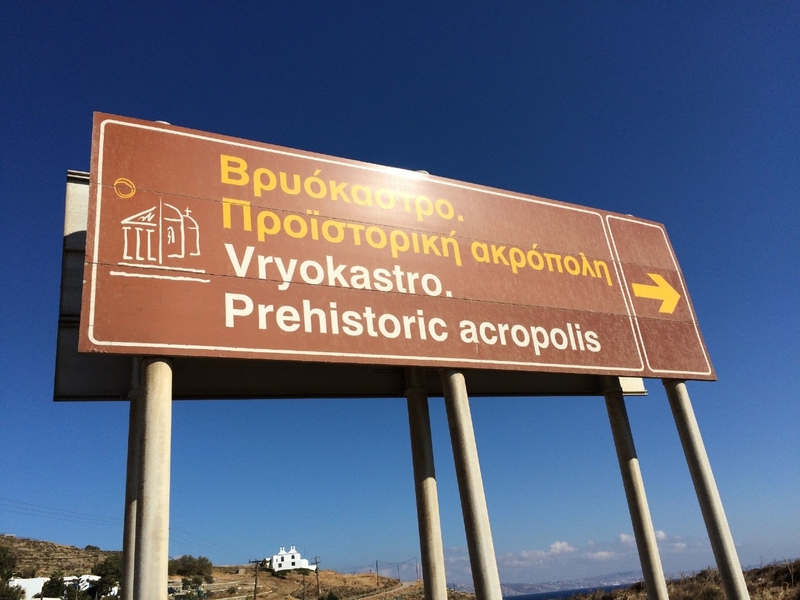 The foundation of Ermoupolis and its velocity, not only in the Cyclades cluster but also at a national level, contributes to the economic and demographic of Tinos. 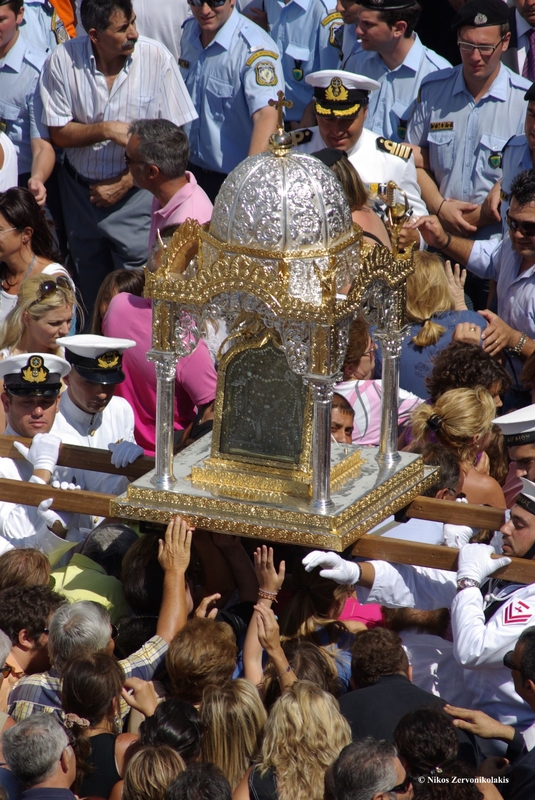 The magnitude of the veneration of Megalohari (Virgin Mary) the intense artistic tradition and spiritual cultivation constitutes its influence and makes it known throughout the Eastern area of the Mediterranean. In Kato Meri, Pano Meri and the significant area of Hora, agriculture dominates, whereas in Exomeria blooms an unprecedented to Greece artistic phenomenon which transforms the island into a cradle of Neohellenic art. The political clashes and wars of the country during the first half of the 20th century scar island life for years. Nazi occupation and decline in agricultural produce lead its residents to Athens. 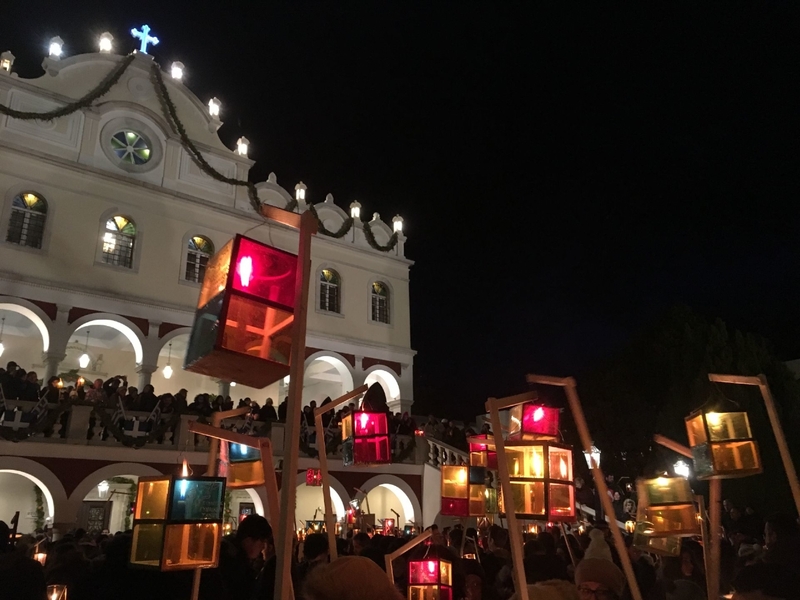 The local economy and social cohesion, with the tradition of the island being the viral link, are gradually restored and lead Tinos to its modern era. Tinos History and Civilization, Vol. A, Borough of Exombourgo, Tinos Island. Georgios Dorizas, Part I: Ancient Tinos, Part II: Medieval Tinos, Part III: Tinos during Turkish Occupation.